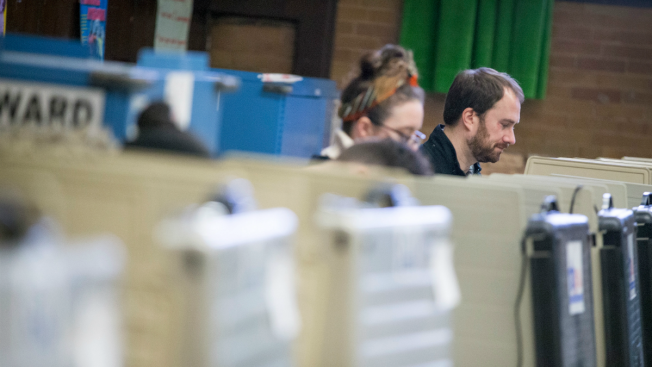 In addition to voting for their candidates of choice, most Chicago-area voters will have a chance to weigh in on various referendum questions using their primary election ballots on March 20. While county officials oversee local elections, the questions specific to certain municipalities will only appear on ballots for residents of those areas, unless it is a county-wide measure. Shall the Village of Hinckley, Illinois, for expenditure on public infrastructure improvements impose a Retailers' and Service Occupation Tax (commonly referred to as a "Sales Tax") of one percent (1%) in accordance with the provisions of 8 -11 -1.3 and 8 -11 -1.4 of the Illinois Municipal Code? Shall the corporate authorities of the Village of Maple Park be authorized to impose a Non -Home Rule Municipal Retailors' Occupation Tax and Non -Home Rule Municipal Service Occupation Tax (sales tax) at a rate of one percent (1%) for expenditures on municipal operations, expenditures on public infrastructure, or property tax relief in accordance with and subject to the provisions of Sections 8 -11 -1.3 and 8 -11 -1.4 of the Illinois Municipal Code (65 ILCS 5/8 -11 -1.3 and 65 ILCS 5/8 -11 -1.4)? Shall the corporate authorities of the Village of Shabbona be authorized to impose a Non -Home Rule Municipal Retailors' Occupation Tax and Non -Home Rule Municipal Service Occupation Tax (sales tax) at a rate of one percent (1%) for expenditures on municipal operations, expenditures on public infrastructure, or property tax relief in accordance with and subject to the provisions of Sections 8 -11 -1.3 and 8 -11 - 1.4 of the Illinois Municipal Code (65 ILCS 5/8 -11 -1.3 and 65 ILCS 5/8 -11 - 1.4). Shall the debt service extension base under the Property Tax Extension Law for Sandwich Community Unit School District Number 430, DeKalb, LaSalle and Kendall Counties, Illinois, for payment of principal and interest on limited bonds be increased from $87,411.12 to $787,411.12 for the 2018 levy year and all subsequent levy years, such debt service extension base to be increased each year by the lesser of 5% or the percentage increase in the Consumer Price Index during the 12 -month calendar year preceding the levy year? Shall the Hampshire Fire Protection District, Kane and DeKalb Counties, Illinois, be authorized to levy a new tax for emergency and rescue crews and equipment purposes and have an additional tax of .10% of the equalized assessed value of the taxable property therein extended for such purposes? Shall the limiting rate under the Property Tax Extension Limitation Law for the Kirkland Community Fire Protection District, DeKalb County, Illinois, be increased by an additional amount equal to 0.20% above the limiting rate for fire protection and ambulance purposes for levy year 2016 and be equal to 0.71128% of the equalized assessed value of the taxable property therein for levy year 2018? Should the DuPage County Election Commission be dissolved and its functions be consolidated with the office of the DuPage County Clerk? Shall Video Gaming, such as video poker and blackjack, be permitted within the corporate limits of the City of West Chicago? Shall the limiting rate under the Property Tax Extension Limitation Law for the Fox Valley Park District, Kane, DuPage, Kendall and Will Counties, Illinois, be increased by an additional amount equal to 0.070000% above the limiting rate for levy year 2016 for park purposes and be equal to 0.41687% of the equalized assessed value of the taxable property therein for the levy year 2018? Shall the extension limitation under the Property Tax Extension Limitation Law for the Bartlett Fire Protection District, Cook and DuPage Counties, Illinois be increased from the lesser of 5% or the percentage increase in the Consumer Price Index over the prior levy year to 21% for levy year 2018? Shall the Bloomingdale Fire Protection District #1, DuPage County, Illinois, repair and improve fire stations and purchase emergency response fleet and equipment and issue its bonds to the amount of $4,500,000 for the purpose of paying the costs thereof? Shall the South Elgin and Countryside Fire Protection District, Kane and DuPage Counties, Illinois, build and equip two new fire stations and issue its bonds to the amount of $10,000,000 for the purpose of paying the costs thereof? Shall the South Elgin & Countryside Fire Protection District, Kane and DuPage Counties, Illinois, be authorized to levy a new tax for emergency and rescue crews and equipment purposes and have an additional tax of .10% of the equalized assessed value of the taxable property therein extended for such purposes? Shall the York Center Fire Protection District, DuPage County, Illinois, be authorized to levy a new tax for emergency and rescue crews and equipment purposes and have an additional tax of .10% of the equalized assessed value of the taxable property therein extended for such purposes? Shall the Board of Education of Maercker School District Number 60, DuPage County, Illinois, improve the sites of, build and equip additions to and alter, repair and equip the Holmes Elementary School and Westview Hills Middle School Buildings, including without limitation, building classrooms for full day kindergarten and early childhood programs at Holmes Elementary School and building science labs and renovating the arts, music and performance spaces at Westview Hills Middle School, and issue bonds of said School District to the amount of $28,000,000 for the purpose of paying the costs thereof? Shall the Board of Education of Community High School District Number 99, DuPage County, Illinois, improve the sites of, build and equip additions to and alter, repair and equip existing buildings, build and equip outdoor facilities and enclosed structures, said projects including but not limited to constructing security improvements, increasing accessibility under the Americans with Disabilities Act, enclosing all or a portion of the outdoor courtyards to increase indoor learning spaces, renovating classrooms, science labs, vocational labs and learning spaces and completing the installation of air conditioning in all classrooms, and issue bonds of said School District to the amount of $136,600,000 for the purpose of paying the costs thereof? Shall the maximum allowable tax rate for the Dwight Fire Protection District be increased from 0.30% to 0.40% of the value of all taxable property within the district as equalized or assessed by the Department of Revenue? Shall the Dwight Fire Protection District, of Livingston and Grundy Counties, Illinois levy a special tax at a rate not to exceed .10% of the value of all taxable property within the district as equalized or assessed by the Department of Revenue for the purpose of providing funds to pay for the costs of emergency and rescue crews and equipment? Shall the Morris Fire & Ambulance Protection District levy a special tax at a rate not to exceed .35% of the value of all taxable property within the district as equalized or assessed by the Department of Revenue for the purpose of providing an ambulance service? Shall the Board of Education of Minooka Community Consolidated School District Number 201, Grundy, Kendall and Will Counties, Illinois, build and equip two school buildings, build and equip additions to and alter, repair and equip existing school buildings, improve sites and issue bonds of said School District to the amount of $90,000,000 for the purpose of paying the costs thereof? Shall the corporate authorities of the City of Geneva, Kane County, Illinois, be authorized to levy a Non-Home Rule Municipal Retailers Occupation Tax and a Non-Home Rule Municipal Service Occupation Tax, each at a rate of one percent (1%), pursuant to 65 ILCS 5/8-11-1.1 et seq. for expenditures on municipal operations, expenditures on public infrastructure or property tax relief? Shall the Clerk in the Village of Lily Lake be elected rather than appointed? Shall the trustees of the Rutland Dundee Township Fire Protection District be elected, rather than appointed? Shall the corporate authorities of the Village of Maple Park be authorized to impose a Non-Home Rule Municipal Retailors’ Occupation Tax and Non-Home Rule of Municipal Service Occupation Tax (sales tax) at a rate of one percent (1%) for the expenditures on municipal operations, expenditures on public infrastructure, or property tax relief in accordance with and subject to the provisions of Sections 8-11-1.3 and 8-11-1.4 of the Illinois Municipal Code (65 ILCS 5/8-11-1.3 and 65 ILCS 5/8-11-1.4)? Shall the South Elgin and Countryside Fire Protection District, Kane and DuPage Counties, Illinois, build and equip two new fire stations and issue its bonds to the amount of $10,000,000 for the purposes of paying the costs thereof? Shall the Village of East Dundee, Il remain a home rule unit of government in order to (1) pay for the Village’s general obligation bonds with home rule revenues and avoid increasing property taxes by $1.94 million (304%); approximately $1,200/year for a home valued at $185,000 and (2) fulfil the Village’s home rule sales tax sharing agreements for planned development projects? Should the Village of East Dundee repeal the newly created trash tax that will cost every homeowner nearly $250 per year? Shall the Village of East Dundee, Illinois cease to be a home rule unit? Kankakee County has no referenda for this election, according to County Clerk Dan Hendrickson. Shall the Troy Fire Protection District, Will and Kendall Counties, Illinois, be authorized to levy a new tax for firefighters’ pension purposes and have an additional tax of 0.073% of the equalized assessed value of the taxable property therein extended for such purposes? Shall the debt service extension base under the Property Tax Extension Law for Sandwich Community Unit School District Number 430, DeKalb, LaSalle and Kendall Counties, Illinois, for payment of principal and interest on limited bonds be increased from $87,411.12 to $787,411.12 for the 2018 levy year and all subsequent levy years, such debt service extension base to be increased each year by the lesser of 5% or the percentage increase in the Consumer Price Index during the 12-month calendar year preceding the levy year? Shall the Village of Deer Park be authorized to increase its current Non-Home Rule Municipal Retailers’ Occupation Tax and Non-Home Rule Municipal Service Occupation Tax (which together are commonly referred to as “municipal sales tax”) from the current rate of ¼ of 1% of eligible sales to ½ of 1% of eligible sales to generate revenue for expenditures on public infrastructure such as Village storm water drainage improvements and roads and streets? Shall the limiting rate under the Property Tax Extension Limitation Law for Arden Shore North Fire Protection District, Lake County, Illinois, be increased by an additional amount equal to .1% above the limiting rate for the purpose of Fire Protection for levy year 2016 and be equal to .215602% of the equalized assessed value of the taxable property therein for levy year 2018? Shall the debt service extension base under the Property Tax Extension Limitation Law for Gavin School District Number 37, Lake County, Illinois, for payment of principal and interest on limited bonds be established at $500,000 for the 2018 levy year and all subsequent levy years? Shall the Board of Education of Lake Zurich Community Unit School District Number 95, Lake County, Illinois, improve sites, alter, repair and equip existing school buildings, including without limitation, constructing life safety improvements, installing air-conditioning in non-air-conditioned school buildings, constructing STEAM (science, technology, engineering, arts and math) labs at the middle school and high school buildings and renovating libraries at every school building, build and equip a school building to replace the May Whitney Elementary School Building, build and equip a library and an above-ground cafeteria as an addition to the Seth Paine Elementary School Building, and issue bonds of said School District to the amount of $77,600,000 for the purpose of paying a portion of the costs thereof? Shall the debt service extension base under the Property Tax Extension Law for Sandwich Community Unit School District Number 430, DeKalb, LaSalle and Kendall Counties, Illinois, for payment of principal and interest on limited bonds be increased from $87,411.12 to $787,411.12 for the 2018 levy year and all subsequent levy years, such debt service extension base to be increased each year by the lesser of 5% or the percentage increase in the Consumer Price Index during the 12–month calendar year preceding the levy year? Shall the City of Ottawa, LaSalle County, Illinois become a Home Rule Unit? Shall the Board of Education of Newark Community High School District Number 18, Kendall, Grundy and LaSalle Counties, Illinois, improve the site, safety and security of and alter, repair and equip the Newark Community High School Building, build and equip a gymnasium and fine arts center addition thereto and issue bonds of said School District to the amount of $16,000,000 for the purpose of paying the costs thereof? Shall the unserved territory in the Serena Community Unit School District #2 of LaSalle County be annexed to the Robert W. Rowe Public Library District, LaSalle County, Illinois? Given that the McHenry County Board in 2017 reduced its property tax levy by 11.2 percent, do you believe that local school districts should reduce their property tax levies by at least ten percent by the year 2020? Shall the office of the Recorder of McHenry County be eliminated and all duties and responsibilities of the office of the recorder be transferred to, and assumed by, the office of the County Clerk of McHenry County on December 1, 2020? Shall the extension limitation under the Property Tax Extension Limitation Law for the City of Harvard, McHenry County, Illinois, be increased from the lesser of 5% or the percentage increase in the Consumer Price Index over the prior levy year to 14% per year for 2018? Shall the limiting rate under the Property Tax Extension Limitation Law for Custer Fire Protection District, Will County, Illinois, be increased by an additional amount equal to 0.2749% above the limited rate for the purpose of opening the Custer fire station and equipping firefighters to provide protection services for levy year 2016 and be equal to 0.4930% of the equalized assessed value of the taxable property therein for levy year 2018? Shall the Frankfort Square Park District, Will and Cook Counties, Illinois, purchase and improve land for new parks, improve existing parks and facilities of said Park District and issue its bonds to the amount of $1,500,000 for the purpose of paying the costs thereof? Shall the limiting rate under the Property Tax Extension Limitation Law for the New Lenox Fire Protection District, Will County, Illinois, be increased by an additional amount equal to 0.2023% above the limiting rate for the purpose of fire protection and ambulance service for levy year 2016 and be equal to 0.59% of the equalized assessed value of the taxable property therein for levy years 2018, 2019, 2020 and 2021? Shall the Frankfort Park District sell the following described real estate: that property identified as Permanent Index Number 19-09-29-400-013-0000 and commonly known as 10840 Laraway Road, Frankfort, IL? Shall the Board of Education of Minooka Community Consolidated School District Number 201, Grundy, Kendall and Will Counties, Illinois, build and equip two school buildings, build and equip additions to and alter repair and equip existing school buildings, improve sites and issue bonds of said School District to the amount of $90,000,000 for the purpose of paying the costs thereof?